Experience Matters: How can patients (or the NHS) know what is going on in hospitals? How can patients (or the NHS) know what is going on in hospitals? Conditions described as “third world“. Four hundred avoidable deaths in a single year. These are shocking headlines and each one represents an awful personal tragedy to families. But of course they are just the tip of the iceberg. For each patient that dies unnecessarily, there will be many, many more injured, damaged and poorly treated. 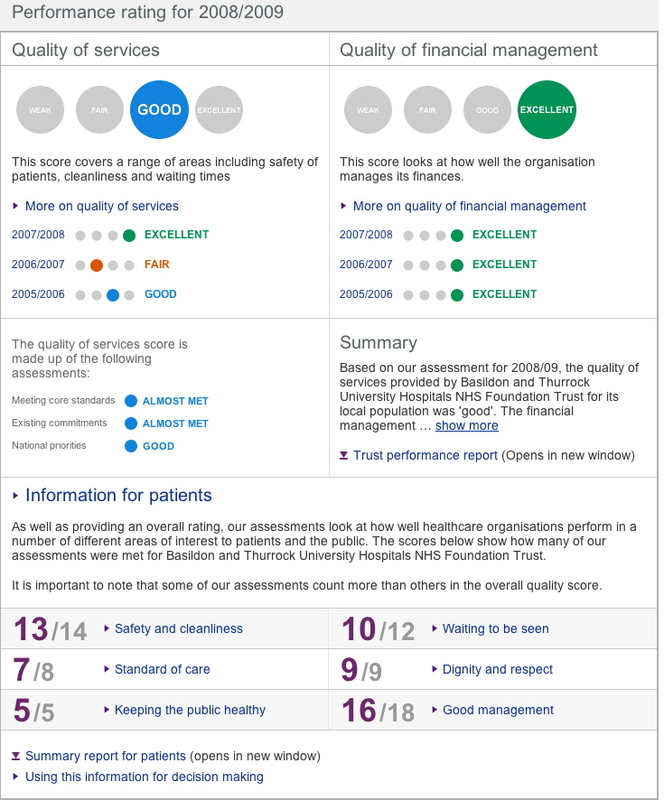 Unfortunately the only people who seem to be surprised by this are the government and their regulators the Care Quality Commission (CQC), which described the Basildon and Thurrock University NHS Hospitals Foundation Trust as “good” just last month - indeed patients using the Care Quality Commission website to help them choose great care will see that assessment there today. Despite all the noise around Bristol a decade ago, and Mid-Staffordshire just this year (“up to 1,200 avoidable deaths“), and despite promises that “this will be the last” - patients still have no way of knowing whether they and their families are being treated in safe, efficient, caring hospitals. But real questions need to be asked about what the staff at Primary Care Trust in Basildon were doing during this time? The PCT has been commissioning care from the Basildon and Thurrock University Hospital and sending patients to a dangerous and (according to the Royal College of Nursing) “third world” hospital. The PCT is supposed to be the advocate of the patients, to take into account the experience and preferences of patients in all their commissioning decisions and to only choose care which delivers high quality and excellent experience. Why did the PCT not know what was going on just down the road? Of course the reason that the PCT had no idea what was going on in Basildon is the same reason that most PCTs and the CQC have no clear understanding of the quality of care delivered by Trusts across the country. If you keep using the same, outdated, disproved methods and approaches for measuring quality you will keep getting the same results. Archaic systems of annual reviews, self-assessment with internal review at Trusts, and sending in CQC inspectors after people have died is unacceptable and would not be allowed in any other industry. So what is the answer? 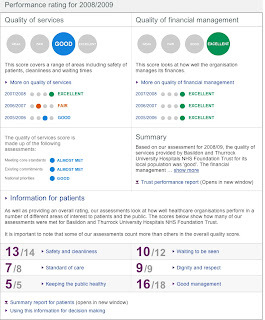 The CQC, PCTs and government have to move to completely new ways of assessing, monitoring and understanding quality and safety. Existing systems are broken, do not work and provide (as Basildon so clearly shows to even the most casual observer) false reassurance. The experiences and opinions of patients have a central role to play here. It is known that patient experience is a powerful way to monitor the quality of care delivered by hospitals. This needs to be captured on a huge scale and in a fully transparent way. This has to be done systematically, continuously, in real-time and in detail across all of health and social care. No individual or organisation delivering care should be free from such scrutiny and the system must be standardised to ensure comparable data are available - this is the only way to rapidly identify outliers without having to wait until their patients die unnecessarily for the investigations to begin. Other sectors have shown us the way: harnessing the wisdom of crowds by using “armchair auditors” in a systematic, structured way will allow the truth about quality in the NHS to be laid bare for all to see. Who will be brave and honest enough to uncover the reality?